If you’ve ever hired a dodgy tradesman, you’ll know all too well how frustrating it is when work is completed at a low price but to a poor standard. When corners are cut during the manufacturing and installation process, it will show in the final product. Poor workmanship is something we come across a lot in our field of work, as many suppliers who provide low quotes will make up the difference to their profit margin by using cheaper, lower-quality materials and rushing through the installation process, which often leads to mistakes and a lower quality finish. Shoddy workmanship also comes with a host of long-term problems, as it will cost you more money and stress repairing the faulty work, or re-doing it only a few years later, and it will lack the aesthetic appeal that quality tradesmen could have achieved. By investing in a reputable, trustworthy company that has a proven track record of success, you’ll not only eliminate the risks of experiencing any of the above problems, you’ll also be able to enjoy all of the benefits that come hand-in-hand with quality workmanship. When you enlist the services of a reputable company, you can rest assured the work undertaken will stand the test of time. If a paving project is supposed to last for ten years, then it will last for ten plus years; you won’t have to worry about repairing, or re-doing the work only two years later. When work is completed properly to begin with, it will be less susceptible to wear and tear, so you won’t have to funnel as much money into maintenance or repairs. Unlike some of our lower quality competitors, when we say our decorative resurfacing reduces the risk of slips; the product you receive will reduce the risk of slips. When you enlist the services of a less trustworthy company, there’s a chance the final product won’t meet your expectations and that promises won’t be fulfilled. One of the more noticeable benefits of hiring quality tradesmen is that your finished project will look exactly like you envisioned. The colours will be bright, the lines fresh and straight, and everything will be sealed properly. Before hiring a tradesman to complete your spray on cement job, make sure you do your research. Visit their website and social media pages, read their reviews, especially their Google reviews, and request to see samples of their work. 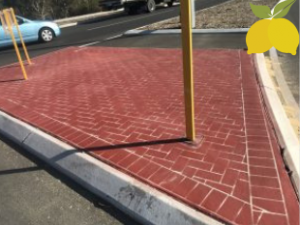 If you want to make sure your commercial cement resurfacing project is completed to the highest possible standards with only the best quality spray on paving, contact Wespray On Paving today! 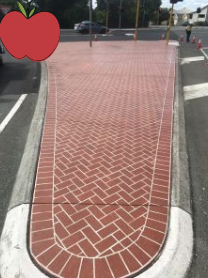 Previous PostWespray On Paving – Albany Fire StationNext PostHow Versatile is Decorative Cement Resurfacing?